The Slider platform is a high performance alloy trail machine that features 140mm front- and 135mm rear suspension travel for aggressive riding. IDS Revo suspension technology is used on this mountain bike model, resulting in a stiff and predictable suspension feel with great pedalling stability. The 275 size wheel with large volume tyres works perfectly for aggressive trail riding, offering a great balance of grip, stiffness and agility. I had a quick ‘chat’ with Dayle Holmes the Industrial Designer at Silverback. Dayle provided some in-depth info into the design of the Silverback Slider. Karlien: What is unique about the Slider Frame? Dayle: IDS is Silverback’s unique and custom designed trail suspension technology. This is a floating pivot design meaning that the bike uses a solid rear triangle that rotates on two sets of linkages. What makes this system different is that it uses a lower linkage that is concentric (on the same axis) to the bottom bracket (where the cranks are attached to the frame). This linkage uses large cartridge bearings to create a stiff and strong attachment point for the rear triangle. This removes any unwanted flex on large impacts and keeps also keeps the power transfer direct. Karlien: How does this improve your performance for climbing and descending? Dayle: The IDS uses a relatively high anti squat value that is optimized to complement dual and single chainring setups ensuring that power transfer remains efficient and direct. The system’s pivot point is floating, meaning it that it changes location as the suspension moves. We have designed it so that the pivot point moves downwards through the travel, reducing anti-squat on big hits to avoid any unwanted pedal feedback but keeping power transfer efficiency when at sag. 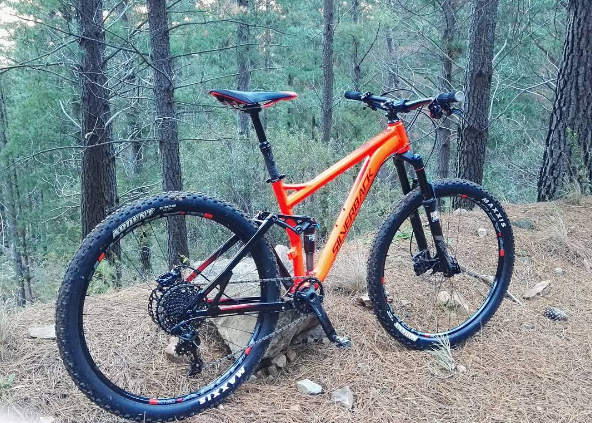 Whenever I get a demo bike to test out, I immediately think, “which trail will be the best suited for this specific bike?” I figured the trails at Jonkershoek would be the ideal terrain for the Silder. Why? Well, the 27.5 wheels, agile brakes, dropper seat post and the IDS suspension system. Jonkershoek trails are situated in the Jonkersberg valley in Stellenbosch. These trails are forever changing, well maintained and designed to test different levels of riding. The Slider handled the down-hills like a champ! Quick & nippy on corners and potent breaks, so very agile. It’s my first time riding with a dropper seat post and I know some say it’s the future for downhill riding. However, this doesn’t seem to be the case for me. I’d rather manually adjust the seat post when I know I am going to enjoy a bit of downhill and want to have the freedom to move. Check out the Slider in action!